Each Yoga posture has an effect on both body and mind. A pose like Mountain (Tadasana) helps a child feel strong and sturdy like a mountain. A back-bending posture like The Wheel (Urdva Dhanurasana) can feel uplifting and energizing like basking in the sun. There are also several postures that can promote a feeling of cool. Cool like, “Hey man, everything is OKAY” Pete The Cat cool. And cool like a wandering mountain brook. Maybe a child needs to cool down because he just had a heated argument with a younger brother or is feeling frustrated with homework. Or, he’s just hot from running outside with friends on an August afternoon. You can use your body to adjust the temperature of your mind and emotions. The sympathetic nervous system is our “flight or fight” response. It’s hot and active. The parasympathetic nervous system is our “rest and digest” response. It’s our resting state when we don’t need to respond to a potential threat in the environment. It’s cool and quiet. To cool down is to shift into rest and digest. Twisting and folding forward poses promote the “cool down” response in the body and the mind. A Simple Seated Twist (Parivrtta Sukasana) sends a signal to cool down. 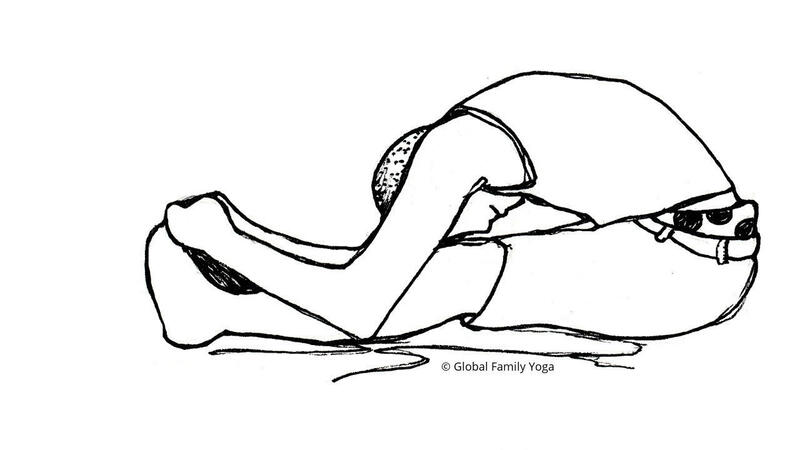 A seated forward fold called The River (Paschimottanasana) is also cooling. The forehead is brought down, the low back is stretched and the body is given a hug of sorts. All this helps a child chill. We can further adjust the temperature of a pose. A lying down twist is more cooling than a seated twist, which is more cooling than a standing twist. When a child is really heated up, emotionally or physically, going to the most cooling pose is too big of a jump on the thermometer. Start with a standing twist and a standing forward fold like Bamboo (Uttanasana). Then sit down and do a twist and forward fold here. Finally, lie down on the back, hug the knees to the chest, rock side to side and then let the knees drop to one side for a supine twist. By this time, the mind and body have cooled down and a child can chill out. Join our mailing list and receive regular Tools, Tips & Techniques delivered to your inbox. You'll receive our Signature System eBook right away - it's FREE! Sign up below.